As I described in my previous post “Do it yourself doubting with the dubio-cube“, I think a team’s or company’s strategy could be described by a number of cubes stacked on top of and besides each other based on how their sides connect. Ideally, I think the shape should be a triangle, or even a pyramid. I will explain why I think it should look like that. First of all, to be fully aware of what we are doing as a team, we should know what we do, how we do it, and why (See post: “Who are we?” and “How do we do it?“). You could call it our team identity. However, when I try to find out everything about our team identity, I find that it’s not instantly obvious how all these things connect. For example, we might have a way of doing things, but forgot exactly why we do it like that. Or we might be very aware of what we believe in, but not how it relates to the choices that we make. Stacking dubio-cubes, I think can help to connect these things. The image below describes how I think the cubes should be stacked. The why-sides of the cube should be aligned vertically, each layar leading up to ultimately our common vision, set of beliefs or values. You can get there by continuing to ask “Why?” for each of the what on a cube. For example, if it says “Benchmark with other companies” on the what-side of a cube, and “To find out what other companies are doing”, you can continue by asking “Why do we want to know what other companies are doing?” and fill in the next cube. It can also be done the other way around of course. If you start with an important belief, or the vision of your team, you can add layars building the fundament of your triangle by asking “What can we do to get there?”. If, for instance, your vision is to become the prefered grocery store in your village, you might build a fundament by adding a cube for “selling the products the people in my village want to buy”, or for “being the cheapest grocery store in the village”. Both valuable ways to help attain the top ‘vision-cube’ I guess. 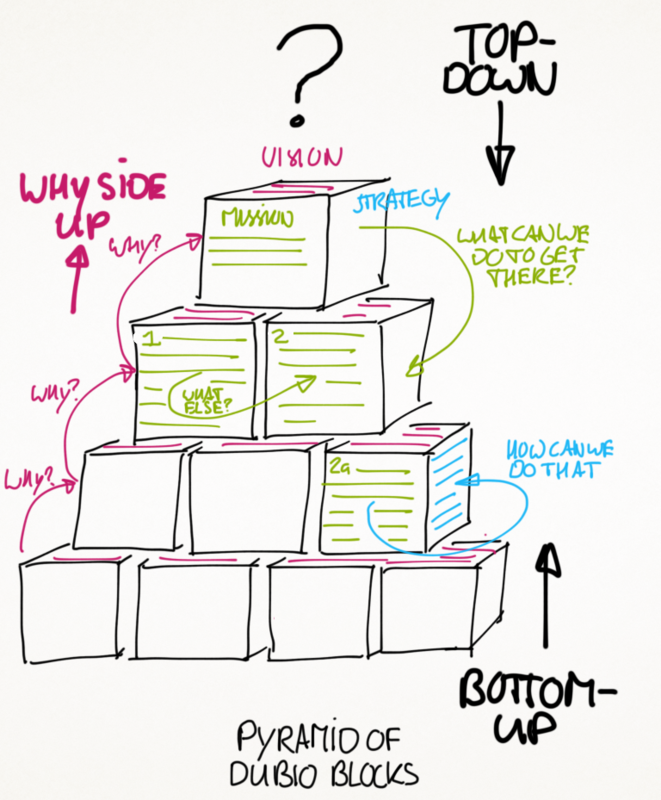 As we all know, pyramids need quite a broad fundament, to not fall over (duh…), and I think this also is true for strategic insight. Having a broad foundation in this case, means you are aware of a lot of options to choose from in order to reach your vision. A good thing, right (See post: “In the middle of difficulty lies opportunity” and “The future has a way of arriving unannounced“)? The ‘how much’- question on the what-side of the pyramid (see previous post) helps to figure out to what extent you choose for each of the options you have. Prioritising. Finally, the foundation of the pyramid (making it a true pyramid, instead of a triangle) can be extended in the other direction by asking “How can we do that” (how-side) for the options (what-side) that we have. Are there other methods? Can we use different tools? For example, if it says “Know what the customer wants” on the what-side of a cube, and “Interview customers” on the how-side, you can consider placing another cube behind it (seen from the same orientation as the picture) saying “Sending out a survey along with our products”. « Do, learn to do, learn to learn to do?